Join the Australian String Quartet and award-winning Australian soprano, Tiffany Speight, for a brave and evocative program of music by Andriessen, Respighi, Golijov and Brahms. Tiffany Speight will join the Quartet for Respighi’s dramatic and declamatory setting of Percy Bysshe Shelley’s poem Il tramonto — The Sunset and two stunning works by Osvaldo Golijov, Colourless Moon and How Slow the Wind. The program will conclude with Brahms’ String Quartet No. 2 Op. 51, in which Brahms takes liberties with form and tempo, contrasting lyrical calm with dramatic twists and moments of turbulence — beauty emerging from struggle. 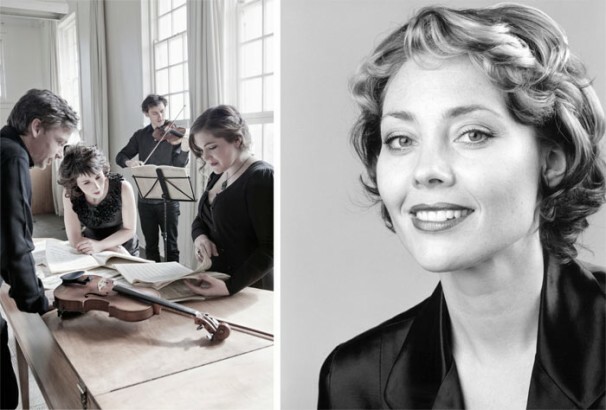 One of Australia’s pre-eminent chamber ensembles, the Australian String Quartet features a stellar line-up, comprising Kristian Winther and Anne Horton on violin, Stephen King, viola, and Rachel Johnston, cello. The members of the Australian String Quartet are privileged to perform on a matched set of instruments hand-crafted by Giovanni Battista Guadagnini between c.1743–1784 in Italy. Among the Quartet’s 2012 performance highlights were its festival appearances at the Trasimeno Music Festival in Italy, Canterbury Festival in the UK and the Automne Musical d’Ollon in Switzerland. The Festival is thrilled to have Tiffany Speight as part of this performance collaboration with the Australian String Quartet. Tiffany is a Helpmann and Green Room Awardee, a recipient of the Vienna State Opera Award and is heavily in demand on the Australian and international opera circuit.